Our toddler activities are designed to promote learning through play. Included below are some of our Fall activities from Teaching Tiny Tots. A great way to reinforce shape recognition is to work with shapes and color in a hands on activity. Using tempera paint and pre cut shapes makes this an easy activity for even a young toddler. 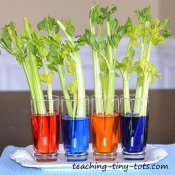 A great way to reinforce color recognition and learn about primary colors. 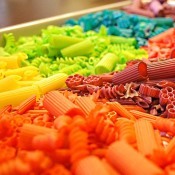 A great way to reinforce color recognition and learn how white can change a color. Carve a pattern or picture with a pencil and print with tempera! Pretty enough to frame. 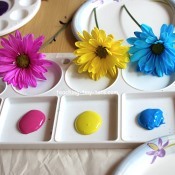 This is a great method for young toddlers to get a great effect. Make flowers with a soda bottle. Great green craft! Makes fun prints and cute cards. 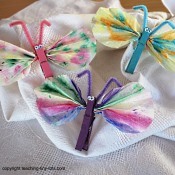 Make pretty watercolor butterflies using coffee filters. Decorate a bag using foam stamps and fabric paint. These tote bags can be found in bulk packs at most craft stores. Great way to interest your child in learning about money...have them paint their own piggy banks. A precious momento at any age...baby or toddler. Pretty cards to send to someone special. Great first printing activity or art activity for a unit on Fall. Paint a Halloween cat! Great activity for even young toddlers. Great way to help develop fine motor skills while reinforcing colors, shapes, and learning how to draw.